Feng shui is REAL! Regina knows as it has helped her numerous times reach goals and achieve balance in her life! She’s a professional amateur on this subject and she explains how it has helped her and how it can help you. Dictionary.com defines feng shui as the Chinese art or practice of creating harmonious surroundings that enhance the balance of yin and yang, as in arranging furniture or determining the siting of a house. Wikipedia defines feng shui as a Chinese metaphysical and quasi-philosophical system that seeks to harmonize individuals with their surrounding environment. It is closely linked to Taoism. The term feng shui literally translates as “wind-water” in English. I first learned about feng shui many years ago when I was dabbling in another career of a personal organizer for Mary Kay Cosmetics Directors and Consultants. I was writing a book on organization (which you can get on Amazon and Barnes and Noble!) and I had heard about feng shui a little bit and I thought it would be cute to include a chapter in my book on how to feng shui your office. 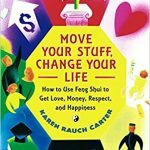 So I bought this book called “Move Your Stuff, Change Your Life” by feng shui consultant Karen Rausch. Her writing style was really natural, easy-going and funny and I was drawn in. I learned about the practice itself and then about the details on how to use it. And then I realized that the feng shui of my house was totally killing parts of my life! Ok, maybe that’s a little dramatic. I mean, nothing was actually dying. But I realized that there were certain things in my home that were completely inauspicious under the principles of feng shui and the areas of my life that these inauspicious things represented I was struggling with. The minute I realized this I knew I had to call a professional. I found one, the fabulous Nancy, and she came over for a consult. She assessed the situation , asked what areas in our life needed a little help and suggested changes we could put in place to enhance those areas. And the transformation was really incredible. We saw major changes almost immediately! And that’s all it took! We were hooked! I know this sounds like an infomercial but it’s really not! Feng shui ALWAYS works. Sometimes it doesn’t work the way you think it will work or want it to work, but it always works. There are several different schools of feng shui but they are mainly divided into the Classical School and the Modern School. The classical school includes the compass method which uses numerical calculations based on the direction the home faces and sometimes takes the birthdate of the person who lives there into account. The Modern School, mainly practiced in the west, is a combination of Tibetan Buddhism, Taoism, Psychology and Traditional Feng Shui. This school is also referred to as Black Hat Sect. This is the school that Nancy practices and the school that I have learned about. The way you determine where the areas in your home correspond to the areas in your life is through a tool called the bagua. The bagua is a map of sorts that is divided into 8 areas around the perimeter and a ninth are in the center. You often see it in an octagon shape although it can appear in a square or rectangle as well. 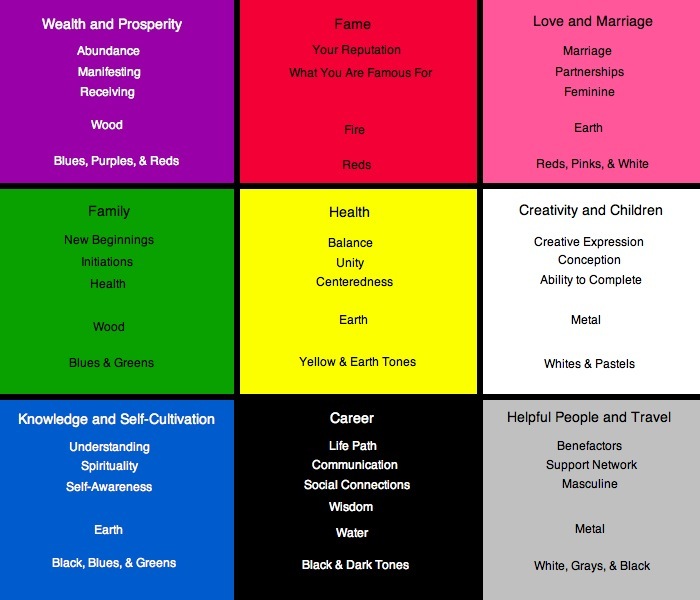 Each of these nine areas in the bagua represent an area of one’s life. So what you do with this bagua map is place it over a layout of your home lining up the front door entrance with the lower areas of the bagua. So as you look at your house from the street, your front door will be either in the skills and knowledge area if it is on the left side of the front of your house, the career area if it is in the center of the front of your house, or in helpful people if it is on the right side of your house. Then seeing where your front door is according to the bagua map, you can figure out where all the other areas of your house are. Missing areas: if you have an irregularly shaped house that is not a perfect square or a perfect rectangle, you may find that there are areas in the bagua that you don’t have. That’s generally not a good thing but there are cures that can alleviate the effects. Locations of bathrooms: bathrooms are not good things for feng shui because, think about it. You use them to flush down waste! There’s a drain in the toilet, a drain in the sink, a drain in the tub/shower and all these drains flush all the qi (energy) away from you. There are more auspicious places for bathrooms than others but having a bathroom in the wealth area, the love area and the health area are usually particularly bad. Unfortunately I have a bathroom in the wealth area of my home that I have feng shui’d the hell out of! Not one house out there is perfect, but there are feng shui cures for any imperfections. Feng shui is not a religion. It is about energy. It’s a practice like yoga that I use to enhance my life. And it is also not necessary to feng shui every area in your home. Focus on the areas that directly affect something in your life that you want to move forward with or enhance. And you can always visit those areas again if further enhancements need to be made. But it works! I promise! So here’s my inspiration for the week: I have read several books on feng shui that have really been helpful. 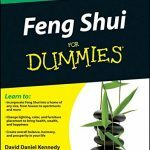 The first one I already mentioned, Move Your Stuff, Change Your Life by Karen Rausch and Feng shui for Dummies by David Daniel Kennedy who was actually the teacher of my consultant, Nancy. But I found this great quote from Feng Shui Consultant, Shivani Adalja. And that’s true! You can’t just hang a crystal and magically everything will change. The energy created by the crystal will get the life force moving but you have to take that life-force and manifest it’s power!